This report is quite possibly one of the more substantial UFO reports of the year. The witness wishes to remain anonymous due to the very public nature of her career with the city in which she works. On Sunday afternoon around 3 p.m. I received the phone call over the OUFOR Hotline. I was told of what happened and immediately got in my truck and drove to the residence in (deleted) from where I live in Salem. While there, I and State Director Skip Shultz investigated the area of the sighting with Shultz obtaining measurements from the home to the where the craft hovered and myself taking pictures. Here is the story along with pictures of the area. Drawing from the witness herself showing the size and relationship to the trees as seen through her window are being processed and will appear here within a day or two so please check back. The witness had laid down along with her husband in bed for the evening and was just getting comfortable. She lays on the edge of the bed closest to the window and her husband closer to the middle of the room toward the door. 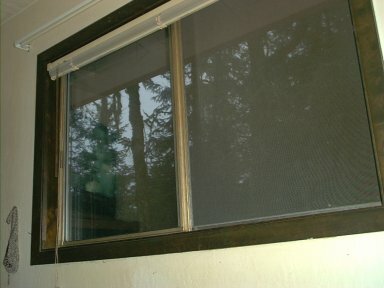 The blinds of the window were pulled up and the window was slid open to the left with the screen on the right allowing air into the room. At between 10 to 15 minutes after 10:00 p.m., she noticed a strong glow of light begin to appear from the top left corner of the window, coming from over the roofs edge and just beyond the thin line of trees which cover a 60 foot stretch between the house and a large expanse of open country just beyond those trees. She lay with her head on the pillow as, what she described as a "really large, plate like, fluorescent lit airborne craft" floated silently and slowly to the right, revealing itself for its size and brilliance as it continued to drift into view. 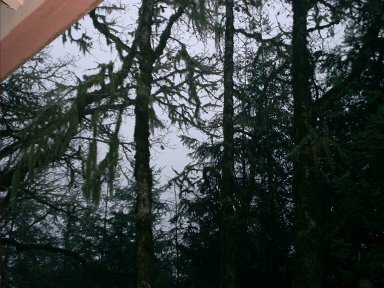 Being extremely dark out the trees between the house and the object created an outline to track the slow movement. This picture was taken from the very spot where she layed as she watched the craft appear out the window. During the first few moments of the sighting the women began yelling at her husband across the bed, "Oh my God, oh my God, oh my God," and pointing. The husband rolled over and said "what?" Dumfounded by what she was looking at, and now about 6 seconds into the 10 second sighting she jumped out of bed and plastered her face against the screen and continued the watch as the now full view of the 100 foot wide glowing craft tilted slightly and came to a stop just beyond the trees some 60 feet away and 50 feet up. She reports that most of the disc was "glowing like the brightness of x-ray light" and that a dome like structure was the only part not illuminating, creating sort of a dark void area on the brightly lit craft. This picture was taken just outside the window for a clearer view of the area where this craft appeared just beyond the trees. Her husband leaned over toward the window and again said "what?" He was still not close enough however to see what she was looking at as the craft was up too high at an angle. The wife was at this pointing watching the last 5 seconds of the 10 second sighting, only in the last few seconds getting beyond "Oh my God" long enough to blurt out "UFO!" and for him to get over and look at it. During this, she describes the craft as being totally motionless, but that the right side of the craft was beginning to disappear as if another dark, unseen object were traveling from right to left in front of it(between the lit craft and the trees) causing the object to black out of sight as it went. She watched until the left of the craft could no longer be seen and was convinced that the craft had not left but was still out there "floating" in the same spot as where she had last seen it. A short argument ensued over his not getting to the window in time to see it and they laid back down. The window was still open. A few moments later, the wife turned to her husband and said "shhhh" after hearing something outside. She got up and again pressed her ear to the screen. Just outside and strait ahead in the darkness she could hear the sound of footprints crunching through the leaves and coming toward the house...steady foot prints and coming from three separate locations in the darkness outside the window. 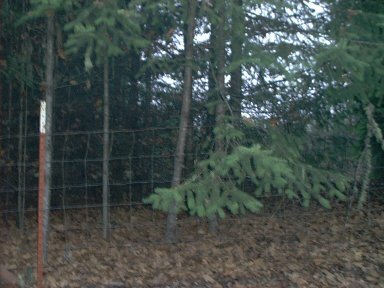 This is a daytime photo taken during the investigation of the bushes and leaves under the trees where the sounds of crunching leaves were coming from. The window is directly behind the photographer. She only listened for a short time... long enough to realize the steps were getting close to the house. She quickly closed the window, dropped the shades and jumped back in bed. The couple eventually fell asleep and nothing more was reported to have happened, as far as they know, for the rest of the evening. This home is in a very remote area where there is a great deal of country expanse in all directions and where but a few neighbors pepper the area up and down the country roads. A return trip will be made next weekend to speak with others in the area in hopes of finding more witnesses to this sighting. The location of this sighting is being withheld in case another report from this area comes in. If anyone else in the State of Oregon saw what is described in this report, please contact OUFOR at 503-463-1467 or through our e-mail address here at Oregon UFO Review. You may also contact Peter Davenport of The National UFO Reporting Center in Seattle at 206-722-3000 who will pass on the information to us.